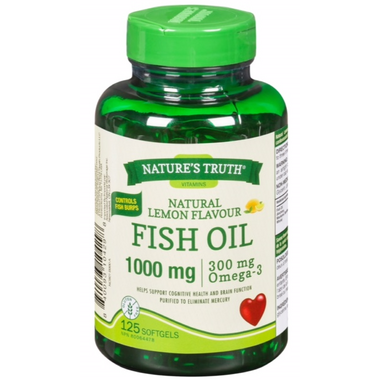 Natural Lemon Flavour Fish Oil 1000 mg helps support cardiovascular health. It also helps reduce serum triglycerides, and helps support cognitive health and brain function. Directions: For adults, take two (2) softgels two to three times daily, with meals. Storage: Store in an airtight container, protected from light. WARNING: Keep out of reach of children. If seal under cap is damaged or missing, do not use.